San Francisco could soon be the first city in the nation to open what are known as supervised injection sites, where addicts can shoot up indoors under the care of trained medical staff. The plan, both controversial and illegal in the U.S., aims to reduce the number of overdose deaths in the San Francisco as well as the staggering amount of used needles scattered across the city. San Francisco could soon be the first city in the nation to open what are known as supervised injection sites, where addicts can shoot up indoors under the care of trained medical staff. The plan, both controversial and illegal in the U.S., aims to reduce the number of overdose deaths in the San Francisco as well as the staggering amount of used needles scattered across the city. Investigative Reporter Bigad Shaban reports. A drug user prepares his syringe while inside Vancouver's Molson Overdose Prevention Site, one of eight supervised drug facilities in the city (May 5, 2018). San Francisco now plans to open two supervised injection sites by August, which would likely be followed by several more within the next year. The move is a response to an explosion of public drug use and the dangerous paraphernalia that is often left behind on San Francisco’s streets and sidewalks. “How about finding another way to save their lives other than offering them their poison?” said Bishop Ron Allen, who heads the International Faith Based Coalition, a drug prevention group in Sacramento that boasts 6,000 members nationwide and opposes supervised injection sites. Bishop Allen speaks from his own experience as a former drug user of seven years. “No addict that is getting high for the day wants to go to recovery, I know for a fact you want your next hit,” he said. Earlier this year, the NBC Bay Area Investigative Unit made national headlines after exposing a dangerous mix of trash, feces, and used needles scattered across downtown San Francisco. City workers collect more than 287,000 used needles each month, however, San Francisco distributes 400,000 new syringes, monthly, in an effort to eliminate the need for sharing used needles, thus, reducing the potential spread of disease. San Francisco is home to 22,500 intravenous drug users, according to data provided by the San Francisco Department of Public Health. Tiffany Falstitch came to San Francisco from Kansas City 8 years ago with the dream of becoming a writer. At 26, she is now homeless, living in a tent on Ellis Street in downtown (April 19, 2018). Halstitch, 26, who moved to San Francisco eight years ago, said she wants to quit drugs but doesn’t know how. “I just want to go back to the person I was … before I came here,” she said tearfully. Advocates argue supervised injection sites can help save lives and reduce the number of used needles littering San Francisco. Outside the United States, more than 100 cities in at least 11 countries are operating safe injection sites, according to Kral. Two men inject themselves with drugs at the Molson Overdose Prevention Site in Vancouver, Canada (May 5, 2018). To see the sites firsthand, the NBC Bay Area Investigative Unit traveled to Vancouver, Canada and gained access inside these rarely seen drug facilities. Vancouver opened its first supervised injection site 15 years ago to combat the city's drug epidemic and high rate of HIV infections (May 6, 2018). The facility, which opened in 2003, is a stark contrast to the dark and dirty alleys that are often synonymous with drug use. “I didn't expect it to be the way it looks -- it looks like a hair salon,” said Alex Randolph, Vice President of the Board of Trustees for San Francisco City College. “It doesn't look like a medical facility.it looks very inviting." Randolph was one of more than 30 business and government leaders from San Francisco to tour one of Vancouver’s supervised injection sites in early May. The trip, organized by the San Srancisco Chamber of Commerce, included representatives from the Mayor’s office, SF Travel, California Growers Association, Lyft, Uber, and several other groups and agenies curious about supervised injection sites. Darwin Fisher, who manages North America’s first-ever supervised injection site in Vancouver, addresses a few frequently asked questions regarding the facility. To get started, click a question below. In the three months after Insite opened its doors, the amount of discarded syringes on streets and sidewalks declined by more than half within the 10 blocks surrounding the supervised injection site. Addicts who use the facility are assigned their own station and provided sterile syringes and a place to dispose of them. When someone overdoses, trained staff step in to inject life-saving drugs. Workers also help addicts get into housing and enroll in rehab services. “Maybe not the first time, and maybe not the second or third time, but maybe on the 10th time they visit the site, the user asks about treatment,” Kral said. Dr. Alex Kral is an epidemiologist with the research institute, RTI International (Apr 20, 2018). Peterson, 28, said the sites have given her a second chance at life – in more ways than one. She has continued to use drugs since running away from home at 13. Since then, she has more often than not been homeless. 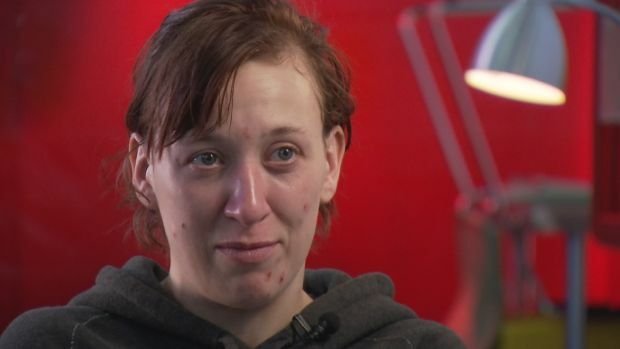 Since visiting the Molson Overdose Prevention site in Vancouver, however, she has been able to get housing and now plans to enroll in college. Stephanie Peterson, 28, spent years living on the streets, but recently secured housing and hopes to enroll in college after finding support at Vancouver's supervised injection sites (May 5, 2018). Photo credit: NBC Bay Area. “They’ve helped me realize how bad my drug using was," she said. For the first time in her life, she says she is finally willing to work towards getting clean. “I'd want to see myself doing something along the lines of working with these injection rooms,” she said. Darwin Fisher runs Insite in Vancouver, Canada, where addicts can bring their own drugs and shoot up with medical supervision. As San Francisco business and political leaders look on, he describes the hazards faced by homeless drug addicts. In San Francisco, drug centers have broad political support. NBC Bay Area surveyed all 11 members of the San Francisco Board of Supervisors. Eight supervisors declared support for the sites, including Supervisors Sandra Lee Fewer, Catherine Stefani, Aaron Peskin, Katy Tang, London Breed, Jane Kim, Jeff Sheehy, and Hillary Ronan. Supervisor Malia Cohen declined to comment, while Supervisors Norman Yee and Ahsah Safai did not respond to the request. “I am supportive of safe injection sites with the caveat that appropriate programming and services, such as access to substance use treatment programs…needs to accompany the sites,” Sheehy told the Investigative Unit. San Francisco, however, faces considerable legal hurdles. Advocates for the centers say they fully expect the sites to be raised by federal drug agents. State legislation has been proposed to legalize these centers, but the Drug Enforcement Administration said the sites still break federal law, meaning anyone using them or even working inside could face prosecution. “Any facilitation of illicit drug use is considered in violation of the Controlled Substances Act (CSA) and, therefore, subject to legal action,” said a statement provided by the Drug Enforcement Administration. In San Francisco, nearly 200 people die of an overdose each year. Tiffany Falstitch, speaking from her tent on Ellis Street in San Francisco, isn’t sure how much longer she can survive on the streets and on heroin.